Discussion in 'Transformers General Discussion' started by Tigertrack, Aug 24, 2010. We all know that Transformers started their lives as Diaclones that were imported from Japan. My question is this. Would "Transformers" have been just as popular if they did not develop personalities for them? I mean, if they stayed true to their Diaclone origin? Now, I know that many of you collect the old vintage Diaclones anyway, I myself would like a few. That's not the question here. Question is, would Transformers be what they are today, if they had no personalities? Just a simple transforming toy? What do you think? I doubt it... Diaclones didn't seem to be that popular. I doubt it would have lasted beyond 1985 in the US. IIRC, in Diaclone they were just machines, not characters. IIRC Diaclone actually FAILED as a toyline in the US. So no, they did need to be changed into 'Transformers' and all that meant to be successful. Sentient transforming robots with a rich fictional background are so much cooler than piloted machines. Robotech/Macross and Gundam would like to have a word with you. I think the popularity would have had to come frome the characters piloting the mechs. If they wern't written well, the show/toyline would have tanked. That all being said, I do MUCH prefer sentient robots. No. They would have ended up like Go-Bots. I was thinking the other day that, maybe if it tied in with G.I. Joe, with the tiny figures representing Roadblock or Duke or whoever, they could have been successful. maybe. no hasbro made transformers as successful as they are today. by hiring talented people to flesh out the personas,origins & stories. Diaclones were/are dandy but I don't see them as living machines. Without the rich fiction of the Transformers, indeed the Gobots would have been more succesfull, maybe. That is, if they could have survived Rock Lords. I think yes! When I was a kid, I met another boy in the holidays who was from Berlin and he had some Transformers and showed me Siren, which was later my first Transformer, as I bought him later, when I found him in a shop. Okay, he told me a bit, that they had a Leader who could turn into a truck, but the Transforming toys fascinated me even without backstory. At the end of the 80s when the cartoon aired here the first time and later they published the Marvel comics here as well, it was a nice bonus to me! Of course I loved the cartoon and the story behind the characters. But the toys did it for me on their own! Everyone of us loved Transformers back then, there was no boy who had no Transformer and that just without any cartoon to advertise the toys. Especially as the Cartoon and comics were a bit too late in our Country, as most of the toys advertised there were not on the shelves anymore... until later when they were reissued in Europe, shortly before G2 started. If it worked in our country, I guess it would have worked in any other country as well. But I guess if they would not have changed the name and left them as Diaclones, I guess they would not be that successful. Uhm, I think they would have much fun, but they wouldn't be a good paradigm for kids, wouldn't they? the popularity would have had to come frome the characters piloting the meths, transformers was imported to Japan in its place and the earliest Generation 1 Transformers toys came. thanks. Don't worry, that guy is a spammer. As for Diaclone vs Transformers, there is no contest. Without Hasbro's input and changes to the Diaclone brand (along with Microman et al) then they would have died away quietly and remained unsuccessful. And they were meant to be classified as REAL ROBOTS. even worse! Takara did failed to keep Diaclone up to its scale consistency. OK Takara got hit by the storm of 1983. (Bank crisis in Japan) and the company must save the production costs. and even worse. Diaclone concepts "evolves" from time to time. the earliest concept is nowhere near what that we known today as Transformers. I BELIEVE that Diaclone was meant to be japanese "Joes with bigger vehicles". i.e. to scaledown Micromen evenmore and make its new storylines. (so Takara will be able to make its VERY OWN real robot so the company would be UP TO its FIERCE competitors). At that time. Transformation concepts is yet to be defined even if it existed since 50-60s (the term "Transform" didn't yet coined. the "marketing" ethymology for such word was very bizzare... CHANGE!). 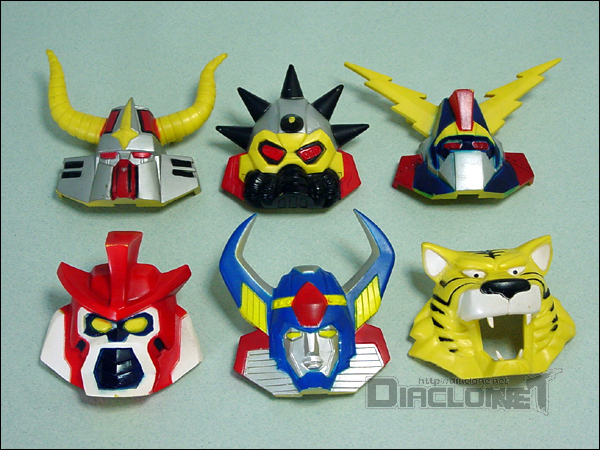 the earliest DIACLONE toys, GREAT ROBOT BASE, has sockets for HERO MASKS [ヒーロー仮面]) (sold separately, consists of licensed japanese super heroes. including Tigermask... same deal with Henshin Cyborg . YouTube - Diaclone: "Great Robot Base"
^ This advertisement is meant to say that Taskforce Diaclone is Five force ranger-style troops. even Diaclone pilot is dressed in such dress. this ad also stated that Waruders will have some form of flyers. alas there's no such flyers belonged to Waruders released. NEVER! Mistake No. 2. failures to keep up with Diaclone figures since its second days of release. if it was marketed as 1/50 scale adventure world. how will Takara explains the existence/ functions of 1981-1982 combiners about each individual parts when not combined?? (Dia Battles, Battle Buffalo/ Big Powered (name reused in TF:Zone), Guts Blockers, Walderos). even worse. the design is very bizzare! leg parts (Buffalo, Dia Battles, Big Powered, and Walderos) are made out of ONE vehicles (and has one crew!). Its size is better off when being an whole robot, one-man crew is okay. at that time.. if i remember correctly, Takara did own/acquired license of another line of REAL ROBOTS and has its anime to market it. and about Guts Bocker. out of 14 individual small vehicles, only fives are crewd. did other unmanned vehicles are drones to one of five pilots? 2. Nissan Onebox Cherry vanette.... (Ironhide and Ratchet) the robot-mode design looks very Macross ish! Takara marketed this vehicle as support one but in the ad. this mech saw ACTIVE frontline roles alongside with Countach carrobot. 4. Freighliner FL86 and its accessories.... this vehicle robot includes both Optimus Prime and Ultra Magnus. 5. Chevrolet Corvet Stingray (Road Rage), the most adorable Diaclone Car robot for me =^.^= . since it is inspired by 007 cars. and it is very close to what 007 should use. i'm still wonder if James Bond is an honorary Diaclone warrior? And i'm not sure if two Mitsubishi civil service vehicles (Fire Engine... Inferno and Crane.... Hauler and Grapple) are actually pilotible? Train Robo (i luv its ad... TRAIN CHANGE!) is also crewed but off-scale, Construction Robo has no crew! Mistake No. 3 ... too much hero toys, too few villains releases. Waruders were too-noble, they should be more horrifying than it is. for me. if Diaclone brand manager realized its real potential and managed it well. Diaclone will become something different, it will become a long-lasting saga that even attracts James Cameron's eyes. it may become much awesome RTS game that becomes a threat to Starcraft and Command and Conquer brand. and finally. it will become something that overshadowed G.I. Joe. EDIT1: early Diaclone concepts (Before Takara got serious with transformable robots ) had been used by Coleco to make "Starcom" series somewhere in 80s. i'm not sure if anyone here have that collection but the demonstration clip said that this toy has the same scale as Diaclones.
. the vehicles however. is more or less Joe ish. Alas at the late years of 90s. this company was taken by the more powerful Hasbro. even after the revival in 2005. Coleco's interest in Diaclone-style toys waned. I'm not sure if Hasbro pays any attention in Diaclone-style figures or even plan to make GI Joe VS Cobra battles in such scales? maybe Hasbro did fear that making "little joes" may lead to Diaclone revival. without regard that several Transformers robot with Diaclone origins are now become rare items eversince the original molds are all gone! Lone Cat: With your post I've learned more today about Diaclone than I have in my many years in the fandom. Thank you! I remember Starcom. I didn't have the toys, but my little brother had a few. Didn't the figures have magnets on their feet? People say they would failed because of the Transformers success,but we will never know. Diaclone did ok.. Their were realeased in US & UK and many other places and sold very well just beacuse of the concept 2 toys in 1. The real problem was fiction they only had few manga chapters in japan and nothing else except for information on the box. If they had a anime japan simlar to macross or Gundam things would totally different. The list could go on forever... even Machine Robo/Gobots were popular in japan. The of faith diaclone woud be totally on the US market,a Diaclone show would have probally been a mix of Voltron/Gundam/M.A.S.K. Would kids of 80s buy into two faction of mecha trasformable pliots beating the crap outta each. Think of like this Cobra Piloting the CONS and Joes Piloting the AUTOBOTs. Would you have wished Transformers kept their "pilots" as a side-kick? Or would you not care for the pilots at all? Are they even worth getting? I've seen a few of them listed on ebay and ponder if they'll add anything to my collection. I dont know? am not a G1 guy but,most could careless about those pilots or Diaclone. For Transformers, I prefer no pilots. After all, TFs are living machines, but, for a Diaclone collection, pilots would make a collection seem closer to completion. 1. Transformers brand were purely made out of Takara's "last struggles". Diaclone line has transformable robots but not the only Takara-own brands that features such toys. remember that Takara did have Microchange. marketed under a more-successful Microman brand. Microchanges were all made by a race of tiny alien humanoid lifeforms (Micromen) as either drone or sentient fighting/support machines to aid in their war efforts against their sworn enemy. Acroyears. but all of those transforming bots are not made to be crewed. and remember. Microman and Diaclone are DIFFERENT scales. 2. As i've said earlier. Diaclone brand manager fails to utilize the playability of Diaclone figures. EVERY Diaclone war machines were marketed as "crewed" but.... for the actual toys. NOT all of them are actually manned. for Car Robots line. several vehicles features seats in vehicle mode but... where's a socket for diaclone drivers in robot mode...? If you were Hasbro. How will you deal with this situation? And it is hard to believe that Japanese quiclkly cherished with American-concepts of super robots. for not being crewed. but being a fully sentient alien being. Once Transformers brand got Japanese release.it IS a Huge success regardless that Super Robot concepts are originated in Japan. and ALL of the earliest TF toys were once marketed by Japanese concepts. and i'm still wonder how did Takara successfully revived Microman brand with all of them re-invented. (And.... has some Microchange concepts returned?! alongside with Actionmaster vehicles (Armored Convoy)?) and marketed them in the same time as Super Doll Licca Chan and Beast Wars II? while the pre-car robots Diacone concepts are left forgotten? c'mon.... revived Micromen are japonized and Acroyears were redesigned. why can't Waruders got any expansion/redesign to be evenmore horrifying? ^ Little Giant Microman anime intro. watch some Microman vehicles being Microchange successor ?! ^ Funny enough. Henkei Henkei! Lambor can houses two Diaclone pilots!